Music is the true soul of language. It washes away from the soul the dust that one collects while treading one the path of life. This soul of language becomes more divine and powerful when the most talented musicians come together and create music with the chords of their heart. ‘Bandish Symphony’ brings such a powerful musical creation. It presents the Sarod master Ustad Amjad Ali Khan’s innovative and brilliantly experimental compositions orchestrated by his disciples, the talented Violin Brothers in a most symphonic manner. Known as one of the 20th century’s greatest masters of Sarod, Ustad Amjad Ali Khan shoulders the sixth generation inheritance of the legendary Senia Bangash School of music. He trained under his father Hafiz Ali Khan and gradually arose as the Sarod player of great repute who gave Sarod a new and yet timeless interpretation. It is his ability to innovate with a great sense of rhythm, sound and feeling that has made him a legendary artiste of international acclaim. The violin is often considered as an instrument with limited possibilities but the Violin Brothers, Deb Sankar and Jyoti Sankar Roy, have successfully used this instrument for bringing out an intricate and an elaborate gamut of emotions and musical patterns. Trained at the London’s Trinity College, the violin brothers harmonize and beautify compositions I a very remarkable way. Their ethereal rendition of notes, mesmerizing melodies and delicate sense of rhythm gives birth to music at its captivating best. Its richness in global moods and embellishments makes their renditions a class apart, ornate with sensitivities of Indian classical music as well as western music. 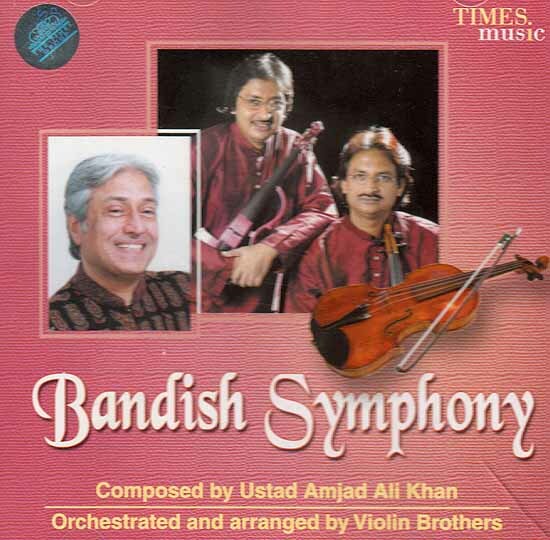 Together Ustand Amjad Ali Khan, Deb Sankar Roy have created a musical marvel in the form of this album – ‘Bandish Symphony’. Rooted in Indian Classical base and layered with a western classical flavour, Bandish Symphony brings to you compositions that are great works of art, embedded with the subtleties of both Indian and Western classical Music. The brilliant merging of musical responsiveness of Ustadji and violin Brothers lends music a new dimension and a sparkling edge of marvel through its Symphonic sound. Enjoy this textured presentation of melody sans boundaries that leads your soul to the heart of peace. Deb Sankar Roy – Solo Violin, Viola, Electric Violin Jyoti Sankar Roy – Solo Viola, Electric Violin.